That’s it. I’m done. There are no more things on my bucket list. It was everything I dreamed it would be. And more. Creamy, delicious more. It’s better this way. There’s no guilt. I have enough lists hanging around my house, unchecked-off, to last me a lifetime. Thankyouverymuch, inspirational movies. Holy swollen udders, people. 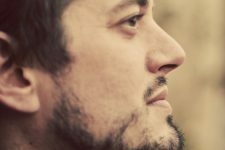 You know how I often say, “This is the most amazing thing you could ever do in your very own home?” (I might not have ever said those exact words, but it’s always implied.) Well, this is at the top of THAT particular list. In fact, I’ve had confirmation from several butter-making people who agree. No matter what – no matter what I tell you right now – you will, I promise you, dance around in your socks and jammies when you start spinning some cream and butter appears. You feel like … Eve. Yes, that’s right. Making butter leaves you feeling like the first woman who ever existed on the face of the earth. That is how empowering it is. I somehow managed to get my hands on cream-top raw milk while I was in Kansas City (thank you, sister), and that’s been my personal rule for the last three years. 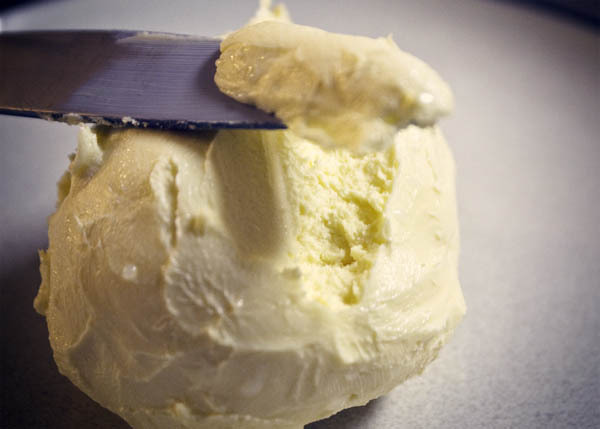 I would NOT learn how to make homemade butter unless I had raw cream to do it with. I have to admit, it was a harsh and restrictive rule. And if I don’t have access again, for years, to raw cream, I’ll still make butter from now on. Probably not exclusively. But I will be doing this again. And again. And again. So when you make butter, the only thing you really need is cream. That, my friends, is ALL YOU NEED. But it can’t just be any cream. Do not buy ultra-pasteurized cream. It will not work, because the butter and the buttermilk will not separate properly. You need as lightly pasteurized cream as you can find (Organic Valley makes incredible heavy cream that’s not ultra pasteurized.) Or, of course, you can use raw cream straight from the moo cow. This is the most sinfully rich butter you could dream of. I kid you not. So, now that you know that you don’t have to go running out into farms in search of raw milk dealers (and I know some of you can’t even legally get raw milk in your states, which makes me feel very sad), just remember: Not ultra pasteurized heavy cream. Organic is best. Go get some. Keep whipping for 3-5 more minutes. Cream and something to whip it in. A food processor with either a plastic or whipper attachment, or just the standard food processor blade. A mixer – of any variety. A jar with a marble or two in it. As you can see, butter doesn’t care how you make it. It just cares that you do make it. Pour your cream into your desired container. So thick … so rich … so raw. I used about 16 oz of cream and ended up with 1 full cup of butter. That appears (upon reading other tutorials) to be spot on of what you can expect your yield to be. Now, with that in mind, it’s probably not quite as cost-effective to make your own butter, but you DO get buttermilk out of the deal, too. So … remember that. This is what my butter looked like after 3 minutes. Just like frothy milk. I was pretty sure I was doing something wrong, so I started to cry and turned the food processor back on. Just like whipped cream, ma. About 1 minute after this stage, I started hearing weird ka-chunk, ka-chunk sounds coming from my food processor. So I figured I probably had whipped cream and a broken processor at this point. And that, my friends, is what you call butter. Technically, it’s done. DONE. But! You still need to do a couple more simple things at this point. After you reach the butter stage, you need to drain the buttermilk from the butter. (And, from what I learned, once you reach the butter stage, you can stop. Letting it whip any longer won’t bring you more butter. Save this buttermilk and make biscuits or pancakes or scones (OR! 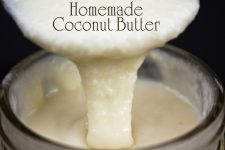 There are even cultures you can by – from Cultures for Health – where you can turn your buttermilk, and butter, into extra tasty cultured treats.) I immediately made the yummiest whole grain buttermilk biscuits after finishing with my butter, upon which I put … homemade butter. Go figure. 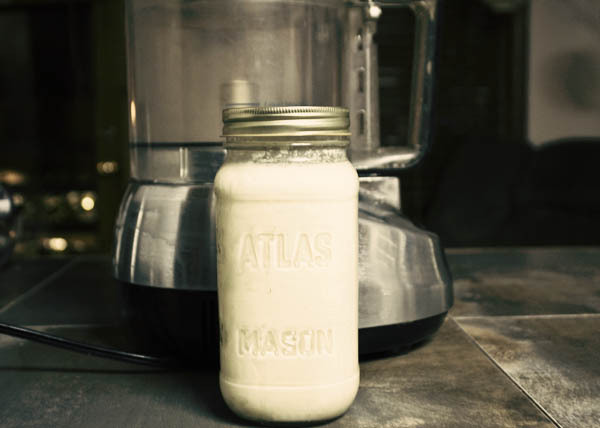 To drain the buttermilk, just press the butter against the side of your container – effectively trapping it in – and just pour the buttermilk into a new container. 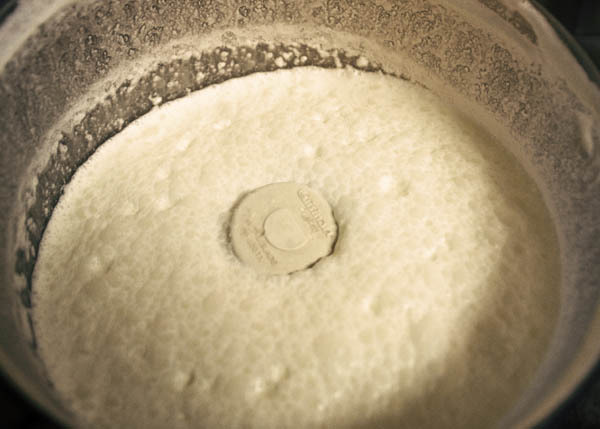 Now, you want to “rinse” your butter – getting off all the buttermilk. This step isn’t necessary, but it will allow you to keep your butter for a much longer amount of time (a week or two as opposed to a day or two). Fill a large bowl halfway with cold water and drop in a handful of ice cubes. You want this water to be as cold as your fingers can stand. Very, very cold. Now place your butter in that bowl and knead it around, squishing out all of the remaining buttermilk. Your water will turn cloudy. Rinsing the buttermilk off the butter makes it keep longer. Quite a bit longer. Repeat this step one or two more times (or until the water stays clear). Of note, several of the tutorials I read said that if you want salted butter, you should add the salt as you’re whipping it (whip it good …). It seemed to me that as soon as I started rinsing off my butter, the saltiness completely left it. Maybe it was just me. But next time I do it, I’ll add my touch of sea salt at the end, after I’ve rinsed the butter off in the water. Seriously yummy. And it took about 15 minutes total. I wish every day was butter-making day. Sigh. Have You Ever Made Butter? If so, tell the rest of ’em how fun it is. Seriously. And if you haven’t … how many days until you try? I’m actually pretty keen to do this. I’m thinking home-churned brandy butter on plum pudding come holiday season…mmmm…. I’m actually an unsalted butter girl, and lately I’ve been finding that increasingly difficult. Why is it always salted anyway? 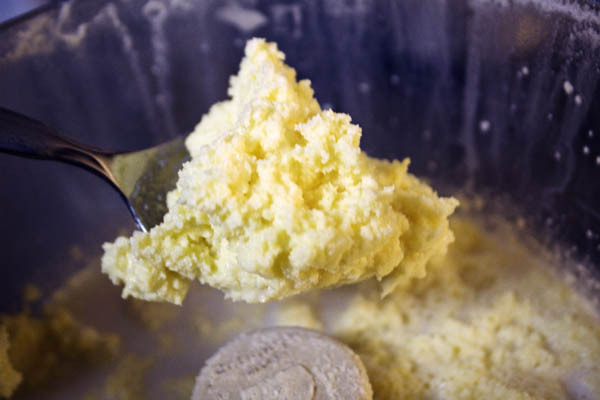 I will make butter in 28 days… that’s how long until I’ll have access to a food processor. But after that–fresh butter for Thanksgiving! All the times that I failed to make Whipped Cream, I threw the heap of potentially delicious buttery goods in the bin! 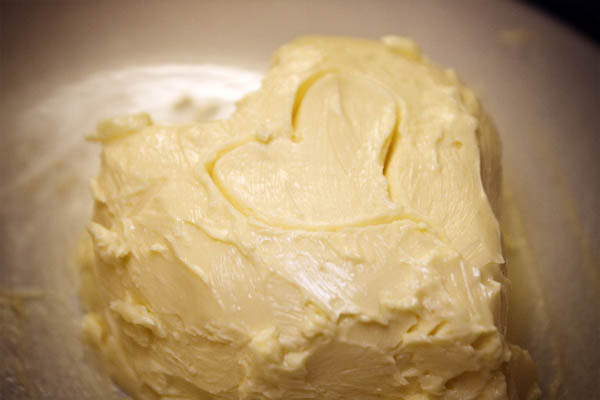 That heart drawn in butter? That’s how I feel about you after this post! But omg, it looks so good! I’m even going to make as a BIRTHDAY PRESENT for my butter loving friend! Anyone know if you can freeze it? My mom accidentally bought a half gallon of organic whipping cream (thankfully from Organic Valley) and she asked me yesterday what she could do with it. Ummm. . . perfect timing for this post!!! If we make up a batch, could we freeze it in small quantities like when there’s a sale at Thanksgiving on butter and we stock up? Any tips would be helpful from previous butter makers. Thanks! This looks delicious and super easy. Makes me want to go bake something. I love making our own butter! It was one of those moments where I as dumbfounded by how easy it was and that I had NO IDEA whipped cream was just one step away from butter. The things we don’t know in our society is kind of sad. But homemade butter? It’s all kinds of GOOD. I first learned how to make butter when I was pregnant with my first baby. (Back in my hippie days!) I stopped bya friends place for a cuppa tea and she handed me a quart jar with cream in it and said “do me a favor, will ya? Shake this until its clunky” Lol! Funny how I still remember that! To my amazement it turned into butter after my arms were nearly worn out. Not the easiest way to make butter, btw. It was amazing and had such a wonderful flavor and beautiful color. It was like magic! I have made it occasionally ever since (over a span of 30 years or so) and its always an amazing process and the results are always great! I have friends coming for Thanksgiving dinner and one of my guests is a 10 year old girl who, I am pretty sure, has never learned how to do this yet. It will be fun to make butte while the turkey is roasting, I think. 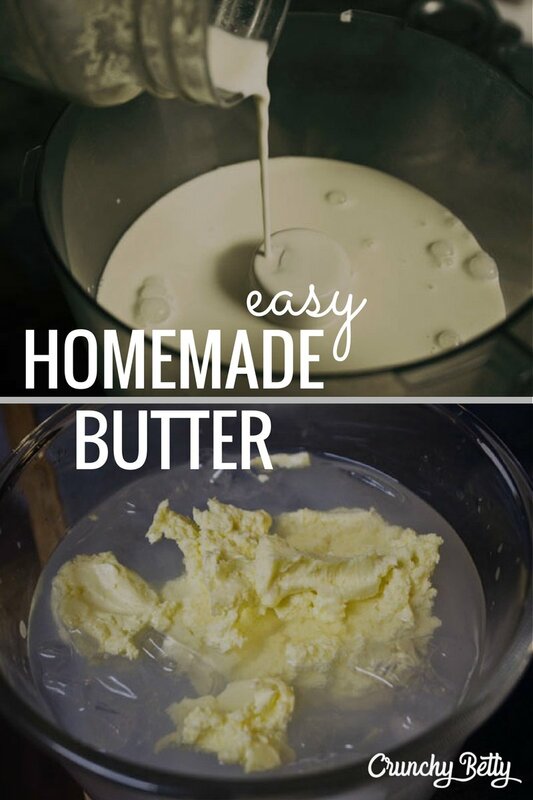 Thanks for your post and reminding me how fun butter making is! Oh, and I add salt after the butter is rinsed. I remember making butter in girl scouts, (in fact my team won the butter churning contest!) It was very satisfying and to this day I remember doing it and the butter tasted really good. We had done it in a butter churn though, and I wasn’t aware that you could do it in a food processor (makes sense though). Perhaps I will be revisiting my girl scout days again soon!! I have made real butter! We get raw milk from a local farm, since we are in a herdshare program. It’s just hard to do when we have to ration out the milk we do get, since we only get 1 gallon and we don’t like drinking skimmed milk. This actually IS on a “to make” list that I have, though technically I have made it before. It was in kindergarten. Our teacher passed the jar of cream around and we took turns shaking it while we sang songs until it finally turned to butter. Then she put it on crackers and we got to eat the butter we all helped make. I remember it being sooooo good! I made butter a year or so ago, by accident. I’d started out to make homemade whipped cream, but it typical ADD fashion, got distracted and walked away from the mixer. Oops. Wasn’t I thrilled to discover I had butter instead?!? I hadn’t realized it would be that easy! My frugal tip: freeze the extras. I took a small amount and put it in a small container for daily use, then froze the extras to pull out as needed. Butter freezes really well, so make a big batch all at once and freeze the extras. Tastes just as good! What do you freeze it in? Tupperware containers or something? I was thinking about those little loaf pans b/c then you could slice it and have the slice for the week or until you needed more. But I’m not sure how well frozen butter slices. I reckon you could shape it into a roll, like a sausage, and wrap it up in baking paper. It won’t freeze like ice, so you should still be able to cut it. Or maybe roll it, refrigerate it, slice it into rounds, and then freeze it. You can wrap it as a roll, but it’ll be sliced, and you can easily break the slices off when you want one. That makes sense, either cutting it after freezing or freezing in rounds. Sort of like a stick, I suppose. Thanks for the great suggestion! Actually, you’ve inspired me. You, and Terran with the garlic butter below. Whenever I want garlic bread I don’t have garlic butter on hand and can’t be bothered waiting an extra 40 mins of roasting time before I even get to cooking dinner. But with this freezing theory, I could make a whole stick of roasted garlic butter, and just cut off a tiny bit for garlic bread when I need it. Thanks for the idea! We’ve been thinking about this but just haven’t gotten the raw milk yet. Here we can buy “Cow Shares” to get the milk and cream. Thanks for the tut. Gotta do this! We did this as a project last year. The kids loved it. They each got a little cream in a tupperware container and they danced around the room shaking it. Soon, we had butter. So much fun. We recently visited the local dairy for their open house, and they were handing out little containers of cream to shake into butter. It was amazing! 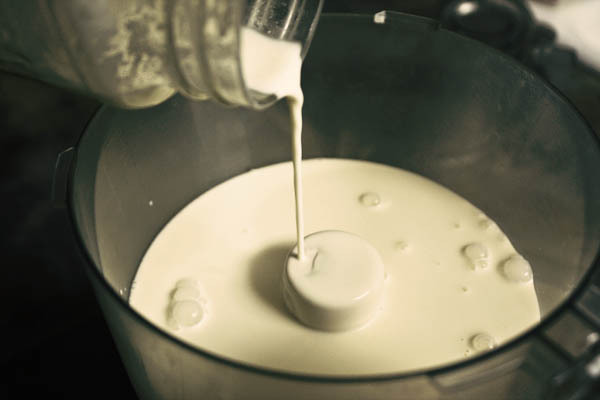 We didn’t squeeze out any buttermilk though…I bet that will make it even better. I’m definitely going to try this at home! That looks so amazingly yummy. Why on earth did I think it required a churn? And arm-breaking labour? I am a butter making fool! Love it! And I love adding a little lemon zest to it. Then putting a nice pat right on top of grilled fish. So good. It’s life altering, isn’t it? In Ireland I churned butter with my grandmother. Up and down and up and down…. and That was the Exciting part of the day on the farm! But it was all so good. The air, the fresh farm food, fresh raw milk from that day….too great to describe! The milk went straight into the cupboard with a clean dishrag over it. My uncle liked to freak out my sister by making sure her milk was super lumpy with fresh cream. When there was “enough” it was time to help churn. Funny how I never even thought about using these great cooking tools to do that here! But I will now! Thanks! Ahahahaha I love your retroactive bucket list. That’s how I roll as well. Its way more satisfying to look at a list of things crossed off and accomplished than a list of things you haven’t done. Anywho, first time commenting, love the blog, and am psyched to start trying all these scrumptious topical and ingestible treats! The first time I made butter, I couldn’t believe it was SO easy! I felt like it was this huge secret that no one knows but everyone should! I used my kitchen aid, discovering in the process that you should DEFINITELY have a lid. Or a towel. Or walls you can hose down cuz that milk starts flying everywhere! But the butter is always so worth it! 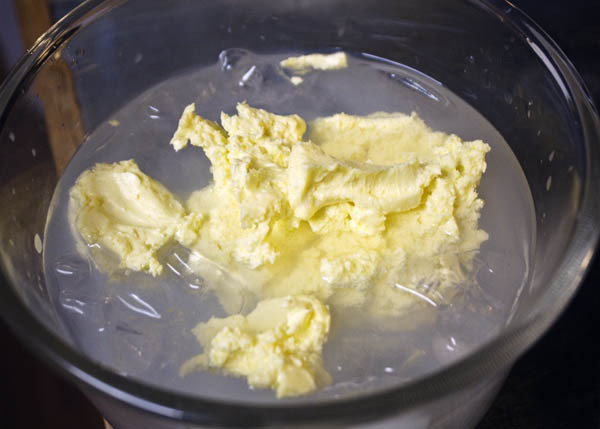 My next step is to try “cultured butter”, where you let the cream age for a bit before whipping it into butter. I have never had it before, but I hear it’s quite lovely. And then I have to get my cream separator working so I can have raw goat cream to work with! Woohoo! I made this in mom’s bread maker. I was reading through the manual she wouldn’t touch and thought it was really cool. Easiest thing in the world and oooh so yummy. Was about the same time I was playing with roasting garlic… can we say roasted garlic butter…. OH YEAH! Yay! 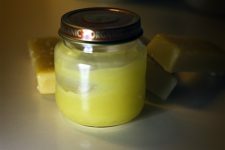 After making my own yogurt, I knew I wanted to try my hand at making butter. I’ve done some research, but your directions are by far my favorite 🙂 Thanks for the post! I did marbles in baby food jars with store bought cream when I taught little-uns, as a prelude to Thanksgiving feasting… loved it. Now to find a raw cream supplier…. Oh how this takes me back. Well, sort of. My grandmother has an old fashioned large wooden butter churned from back in the day. Not sure if she every used it, it was more of a decorative accent in her house. Nonetheless I always asked about the butter churned as a child and wanted to make my own. Homemade butter in my next crust. Oh, now, that looks absolutely DIVINE! I do have to add one word of caution if you use a Kitchen Aid…. KEEP A TOWEL OVER IT! You’ll end up with most of your cream all over the place! On the subject of raw milk labels, my great-uncle Pete owns cows, and people used to come to him to buy milk. He would say that he couldn’t sell his milk or eggs because the milk wasn’t pasturized and there was no guarantee that the eggs were unfertilized… but he keeps the extra milk and eggs in a shed near the road, and sometimes people come in and take it. They even sometimes leave a few dollars in the gallon jar that happens to be by the door! But of course, he’s not selling any. I am going to try this. Thank you for all the good stuff that you bring to us. have a blessed day and keep up the good work. just fyi, it’s not really buttermilk that separates. What you get is butter and whey. If you use the milk that separates from the butter in recipes that call for buttermilk, you will be SO disappointing. Don’t waste the whey though!! It’s so good for so many things, like drinking! I thought “whey” was the separation of curds when making cheese? Would that mean if you started with cultered cream, you’d get real buttermilk then? Oh yum yum yum! I’m so on this. Every year, the third graders in our district go to a pioneer site and make butter. I’ve been able to go twice and LOVE the pioneer cooking, ice cream making, butter churning, biscuit making, oh so tasty. I am going to make butter for my birthday dinner tonight. YUMMMY!! I enjoy making all things “homemade” so I cannot wait to make butter. Anybody out there use butter molds?? I’m thinking this would make great gifts!! Raw milk products being outlawed for sale here in Ontario (boo! ), I went shopping this morn to find the highest fat content product I could – ended up with organic Crème fraîche with 40% MF because the only ingredients were cream/bacterial culture. The additives list on the “whipping” cream was unreal (& none of which I wanted to end up in my homemade butter!). So basically, I was halfway there already…used my handmixer & was surprised at how once the liquid separated, it really started to fly – one plus for using the food processor, but I don’t much like cleaning that thang either! LOLWhipped up a batch of Walnut Maple Cranberry Buckwheat Scones to slather it on – ***YUM***Now if only more folks could get over their saturated fat phobia & know how GOOD this is for our brains – to say nothing about how decadent it tastes!Now – we just need the recipe for Betty’s Buttermilk Biscuits please…Thanks for the nudge – so many of these things are so blissfully easy to do ourselves. We just need someone to keep reminding us of that! + 1 tsp. vanilla or maple extract. Stir to combine. Turn onto floured surface & knead ~ 12 times. Pat into round & cut into 8 wedges. Place on parchment lined sheet & brush tops with reserved egg/milk. Sprinkle tops with sugar if desired. Bake at 425 degrees 10 – 15 min. Cool on rack. SLATHER with homemade buttah! 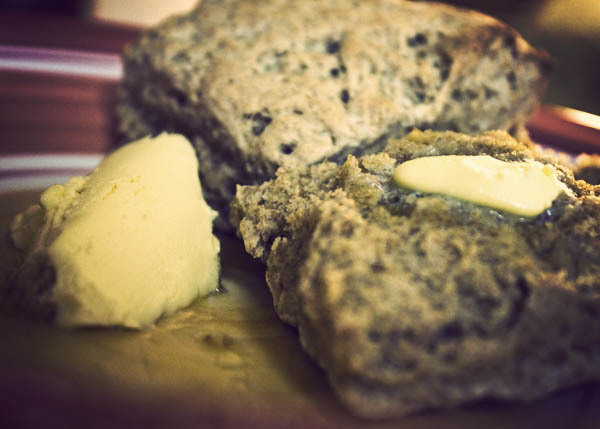 Sorry – can’t edit…typo: Should read 1/2 cup butter! I meant to add that the “cultured” result from the Crème fraîche beginning was an added flavor bonus! My husband just participated in a local bake off. When we arrived the other contestants were talking about how they couldn’t get local butter. I thought to myself, ‘can’t you make it out of heavy cream?’ Yes you can!!! I knew it!!! I use to work at a diner where we had to make whip cream every day. Occasionally I would over whip it and make butter. I’ve used a paint shaker to make butter!!! In a paint can, Tkovacs? I work at a Benjamin Moore store & I’m sure I’d never have thought of that… centrifugal or up&down shaker? I’ve been waiting to find raw cream to make butter but I may just go ahead and make it with pasteurized cream now that you’ve upped my hankering for homemade butter to the moon! 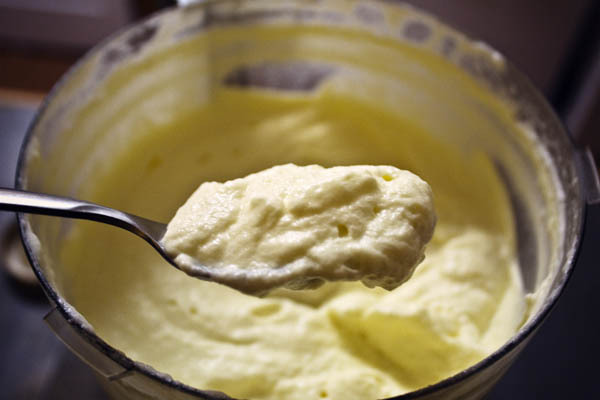 Making butter was a magical experience for my kids when they were little. I would have them pour heavy cream, a dash of salt, and a sprinkle of turmeric (to add a touch of yellow, so that they could see it better) into a small, very secure Tupperware container. Then they would take turns vigorously shaking, rolling, throwing, and dancing with the container. I would join in when they got tired. It seems to take forever, but then, like magic, a ball of butter forms inside the container. Ah I made butter this summer. I read a blog post and became very serious about it. However our blender had just broken so I did the shake it in a jar method. It took FORVER and I picked a hot day to do it. I also don’t think I drained it enough. I’d like to try it again using a blender/food processor. I made homemade butter with my mother when I was about five or six it would have to be because we were still in our old house. I can not for the life of me remember why, but I do remember that to my five or six year old mind it was fun. I got to use the hand mixer. That was always fun for me as a kid! I don’t really remember if I liked it or not, though. I was never really a huge fan of butter. I skimmed this post, and when I reached the end, where you ask A Large Important Question, my answer was immediately, ‘Who hasn’t?’ Because, you know, in elementary school, you learn about pioneers or the Amish or whatever, and they say, “…And they couldn’t just go to the store to buy some partially hydrogenated (butter flavored) vegetable oil spread, so they used milk from cows, and made their own butter!” And then they hand you a baby food jar with milk and stuff in it, and tell you to shake it around until it is solid, and you shake it up, and spread it on toast, and you are the proudest kid in the world. It’s not as fun as yours looks, but I thought everyone did that. I never did this in school, and I feel deprived. I intend to do this this upcoming weekend. I add the rinse water right into the food processor and let it do the work of mixing it in, works great! Also, the very very best way to keep it fresh has to be a french butter dish – a must have! I just made this a little bit ago to have for thanksgiving. It is sooooo good!!! I used the walmart brand heavy cream that -is- ultra pasteurized. Only because I didnt want to drive a half hour to a dairy. It worked good though! It took a while for it to go from the whip cream to the butter, but when it did it happened in an instant. It almost makes me want a milk animal on our property, if only someone would milk it for me! omg I just made some butter…brilliant! And so, so easy. Next time I think ill add some of my lavender honey! My brothers and I made it by filling a jar with cream and rolling it around on the floor for a while. But google came to the rescue, so we continued rolling it around on the floor and ate crackers and butter for the rest of th night. Butter! Check! I can’t tell if my stomachache is from the ab workout (I did the shake-it-in-a-jar method) or from eating (a) whipped cream and (b) butter in rather excessive quantities. Ohmygoshit’sgood. I used low-heat pasteurized cream (a brand called Denmark here in Korea) and just did the jar thing — it didn’t take that long, but it was a workout. No marbles necessary. Now I’m eating a fried egg. And I fried it in BUTTER. I am whipping my cream right now with a hand mixer at the highest setting there is, but the thickest it is getting is about the consistency of really thick whipped cream, but still, no butter. 🙁 what am I doing wrong? Oh my, I’m so excited to try this! What attachment would you recommend for a mixer? A whisk? I found your blog by chance… looking for a homemade oven cleaner and Oh my goodness, I have to do this! Hi, I just found your post….and I now want to make some butter!!!! As a kid….some almost 40 years ago. I lived in Kentucky and we lived on a farm and always had fresh cream. I would make butter and buttermilk every couple of days, we had a real butter churn and butter molds. I always added the salt after the cold water bath, then molded it and would freeze what we didn’t sell to local neighbors. Of course I no longer have a churn or butter molds, but thought that I would use my silicone cupcake baking thingisy to mold my butter….I have differnt shaped ones (would turn out cute as well as delicious)!!! Can’t wait to try this! I saw this post many months ago and when I was ready to try it I couldn’t remember what site it was on. I searched and searched, couldn’t find it. Then, just now, I was searching for homemade window cleaner and there it was Crunchy Betty! So I not only got a great window cleaner but I get to make homemade butter too. Very excited. You are hilarious!! 🙂 Love this site!! While I worked at Starbucks I would constantly amaze my co-workers by putting heavy cream in an iced Grande cup with a sticker over the lid, and shaking it until we had fresh butter. They were so agog at my skills that they didn’t notice I wasn’t really working for the 15 minutes it took to make it. I get butter and slack time? Win-win. I’ve made my own butter. It was a lot of fun, it was yummy, and it DOES make you feel like Eve 😉 After I rinsed it, I scooped it into ice cube trays, and when the butter cubes were frozen solid, I dumped them out into a freezer container. One cube was just right for two slices of toast – about two TBS worth. Freezing it meant I had to plan ahead a little bit by thawing a few cubes before preparing a meal. If I didn’t freeze it though, I would always wind up having to throw a lot of it away because it would go bad quickly. Here’s my question. In the blackhead removal post, it says you can use buttermilk and nutmeg for a scrub, is this buttermilk ok? Or should I use store bought? 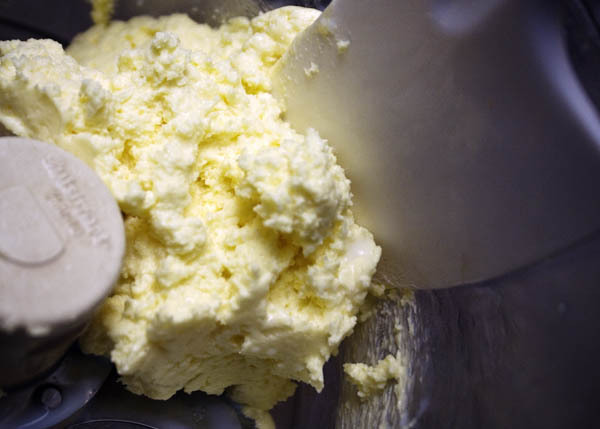 I’ve made home made butter from ultra-pasturized heavy cream before, and have never had a problem with it separating into butter.By the way, I love the way you put it “straight from the moo cow”.That’s what I call them, too!